A podcast about all things Macintosh. For Mac geeks, by Mac geeks. Episode 308. Based on the success of last month’s “no agenda” cast I re-dubbed the format the “uncast” to bring you it’s second installment. For part duex I brought over a couple of friends from the KnowTech podcast. John Foster, Kenji Kato, and I sat down to chat about all things Mac. No prep, no outlines, no show notes just pure unbridled Mac geekiness. We uncast the structured format and see what hits the feed. Enjoy. A podcast about all things Macintosh. For Mac geeks, by Mac geeks. Episode 018. In this episode we try to help a listener who wants to set up an alternate “from” address to use when replying to and sending email from his Mac or iPhone. A podcast about all things Macintosh. For Mac geeks, by Mac geeks. Episode 017. In this episode we answer a question from a Maccast Member who wants to know how to burn an appendable CD using Mac OS X. A podcast about all things Macintosh. For Mac geeks, by Mac geeks. Episode 016. Continue our “Deep Look” into Apple’s suite of iLife apps. This episode is all about Podcasts. How to subscribe, manage, inspect, and tweak your feeds and subscriptions to get the most out of your shows. A podcast about all things Macintosh. For Mac geeks, by Mac geeks. Episode 015. In this episode I put the spotlight on Spotlight. OS X offers up a very powerful built in metadata search and I try to give you some helpful tips and trick for maximizing your searching and results. 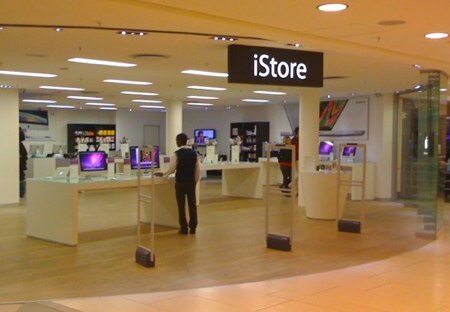 Maccast listener Joe is in Johannesburg working on the World Cup and sent in some snap shots of an iStore. It looks very much like a typical smaller Apple Retail Store you might see in a US mall, but it obviously wasn’t an “Apple Store”. I’m pretty sure iStore is a local chain or brand, but behind it is a program run by Apple called the Apple Premium Reseller program. These are local resellers authorized by Apple to sell Apple products and accessories. You’ll find Apple Premium Resellers in many countries like South Africa, UK, Germany, etc. They are retail locations staffed by Apple experts and offer many services similar to ones you would find in an Apple operated retail store. Services like seminars, events, business solutions, and educational pricing. At least for some. Starting Sunday many of you emailed me to let me know that Apple had started sending iPhone shipping notices for your pre-ordered iPhone 4’s. One thing I noticed in several of the emails was that the arrival date was noted as June 23rd, a day before the officially announced June 24th date. I figured it was the scenario we had seen in the past where the shipments start, but Apple requests the shipper hold the items until the actual launch date. Well now it’s looking like this time will be different. So I guess that date was correct. What is not clear at this point is why Apple bumped up the date. A logical guess is that there are concerns over the volume of activations and they may be trying to spread the load between at home deliveries and in-store pick-up which will still take place on the 24th. I’m glad that many of you will be getting your new iPhones a day early, but I do have to mention this will likely create some outcry from those who weren’t able to get their pre-orders through Apple and AT&T’s systems. Either way I expect Thursday and (now) Wednesday will be both exciting and frustrating for Apple fans.